FORCE Shyang Yun Tools Co., Ltd. was established in 1984 and has been a manufacturer and exporter of professional tools for more than twenty years. We are proud but not conceited. Shyang Yun keeps monitoring the rapidly-changing markets, foresees the trends of professional tool industry and makes quick responses. This spirit of seeking competitive advantage is shown not only in products but also in organization. 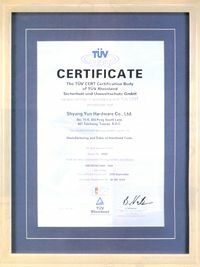 While new ideas and innovations are infused into FORCE tools, Shyang Yun was also reformed to be certified by ISO 9002 since year 1994 and by ISO 9001 since 2003. Continuously improving quality, variety, logistics and service brought FORCE dramatical growth over the past few years. FORCE has become a reliable name in people's mind and Shyang Yun also builds long-term and strong business relationships with customers all over the world. In the future, we will persist in our faith and promises: Quality, Responsibility, Honesty and Service to make the success going on. As main specialization full-service oilfield supply company AZ Supplier offers distribution services for all products of FORCE in territory of Kazakhstan.